With 40+ thermoplastic polymers in general use, one could expect there is an existing material capable of meeting any performance criteria. After all, plastics span a performance spectrum from inexpensive commodity resins to high performance engineering resins. Wading through all the polymer options can be a simple or laborious exercise depending on whether you have clearly defined usage specifications and have a good understanding of the performance capabilities of various polymers. For many applications, plastics are increasingly expected to provide more than just a simple external shape in the form of a sleek, colorful housing that commodity plastics routinely satisfy. It’s common for modern applications to be brimming with features to increase their functionality and appeal while also having requirements for portability to meet consumers’ on-the-go lifestyles. Simply using a higher performing engineering resin to obtain added performance to meet growing requirements can be an expensive proposition with plastic material prices ranging from less than $1 to nearly $50 per pound. Instead, enhancing the performance of polymers you are already familiar and comfortable with by using plastic compounds might be the right solution. Compounding combines additives into polymer matrices greatly expanding their performance envelope. When performance demands or the desire to reduce weight translates into a need for plastics with increased mechanical properties to satisfy structural requirements, then fiber-reinforced plastics should be at the top of your materials list. Using fiber reinforcement to enhance plastics stiffness and strength is an excellent method to control material costs. Up engineering low cost polymers through compounding to give them needed performance is typically less expensive than utilizing higher cost materials outright. 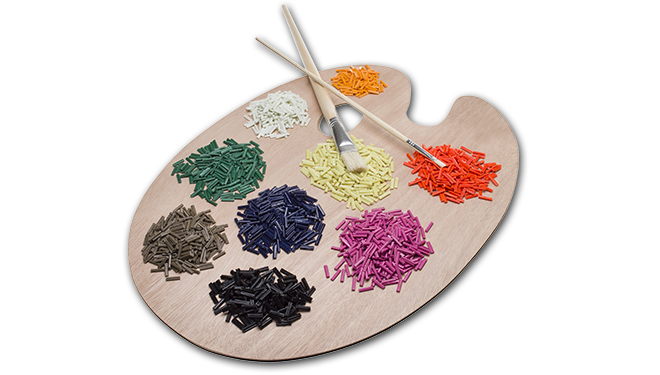 In addition, sticking with polymers you know provides a valuable risk reduction element. Compounding can combine a wide range of fibers into thermoplastic matrices to boost their mechanical properties, but glass and carbon fiber are the most common and universal types of fiber used to reinforce plastics. Most fiber-reinforced plastics are available in two variants: short fiber compounds and long fiber composites. In short fiber materials, chopped fiber filaments are melt blended with a host polymer using a compounding extruder. In long fiber materials, a pultrusion process impregnates continuous fiber strands with molten polymer. As the names of these variants imply, the length of the fibers in the material are either short or long. The mean fiber length in short fiber material is typically less than one millimeter. 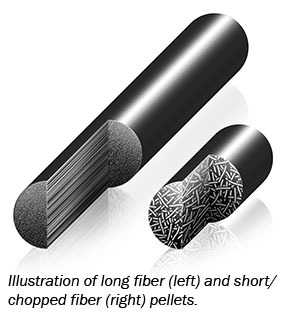 In long fiber, the fibers are unidirectional through the full length of the pellet. 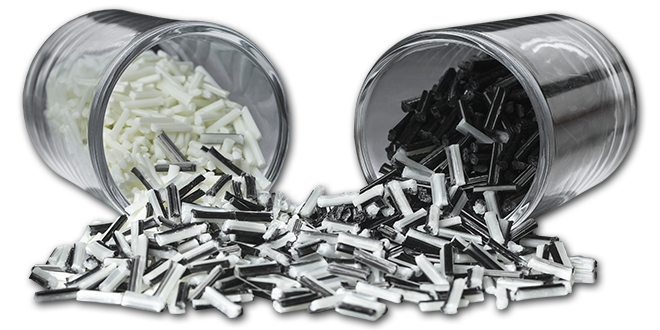 For processing via injection molding, long fiber is cut into 1/2 inch (12 mm) pellets to facilitate material handling and feeding. With all fiber-reinforced polymers, retention of mean fiber length during processing is critical to achieving optimum material performance in molded components. Fiber attrition can occur while the material passes through the injection molding machine screw used to mix and feed the polymer as well as from tight radii turns and undersized gates in runner systems used to transport material within the mold. What type and length of fiber you use is dependent on the level of performance increase needed. To condense our discussion, we are going to limit our examples to glass and carbon fiber reinforcement in polypropylene and nylon 6/6 (polyamide 6/6) polymers. 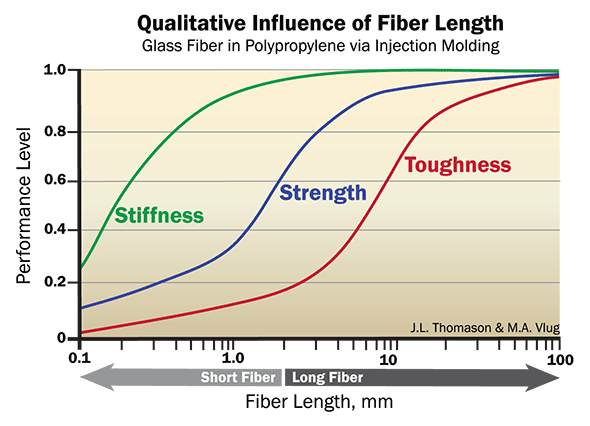 The graph above shows the qualitative effect increased glass fiber length has on polypropylene performance characteristics. Initially stiffness, measured through tensile modulus, is increased; then by employing fibers of greater length, strength, measured through tensile strength, goes up; and finally toughness, measured through notched impact resistance, is boosted. 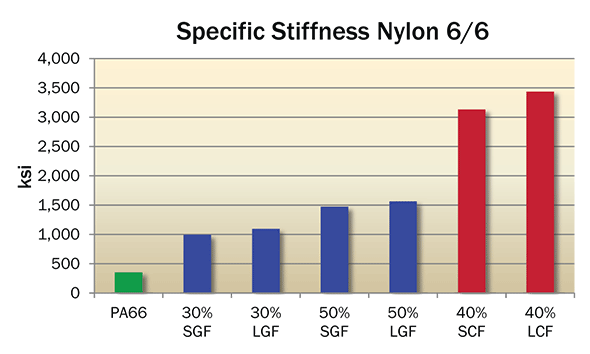 The graph above illustrates this effect in nylon 6/6, short and long glass fiber loadings of 30% provide a relatively similar 3X gain in stiffness and as the glass fiber content is increased to 50% a similar 4X rise in stiffness occurs. A significant boost in stiffness, almost 10X over the unmodified polymer, takes place when combining a 40% loading of more rigid carbon fiber into nylon. The difference in fiber length between short and long carbon fiber variants contributes just a modest 9% of additional stiffness. Increases in stiffness that come through fiber reinforcement also contribute to a substantial increase in heat deflection temperatures (HDT), also known as deflection temperature under load (DTUL), which is a measure of a materials short-term load carrying capability at elevated temperatures. Unmodified polypropylene has a HDT of 130°F (55°C), adding 30% short glass fiber increases the HDT to 285°F (140°C) and the same loading of long glass fiber raises it another 15°F (9°C). Similarly with nylon 6/6, including 30% short glass fiber increases the polymers HDT from 150°F (65°C) to 460°F (238°C), substituting long fiber hikes the HDT another 20°F (11°C). 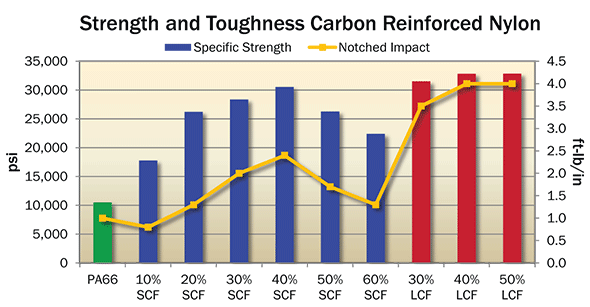 The two graphs above highlight the contributions glass and carbon fiber respectively make to the strength and toughness of nylon 6/6 polymer. Incremental increases of both short and long fiber lengths along with glass and carbon fiber types provide a stepped approach to boosting strength to desired levels, to a point. Short glass fiber almost doubles nylon’s specific strength with a 1.8X performance boost when 50% is included; the same amount of long glass fiber takes strength performance up another 30% to a 2.3X level. Not surprisingly, carbon fiber, which is synonymous with high performance, provides a 3X increase in strength over unmodified nylon 6/6 giving these composites strength-to-weight ratios that are on par with metals. At glass fiber loadings above 50% and interesting effect is illustrated in the graph for this fiber type, strength performance begins to decline instead of continuing to increase. This results from a saturation of the ductile polymer with reinforcement that hinders efficient energy transfer. The fiber level at which this performance drop occurs varies from polymer to polymer and with different types of fibers. For example, with carbon fiber in polypropylene maximum strength peaks at a lower loading level around 30%. Alignment of fibers is a significant design consideration as fibers typically align in the direction of polymer flow as molds fill. Better performance occurs when designs take advantage of this characteristic and directional forces are perpendicular to fiber alignment. Tailoring of fiber alignment is possible through judicious placement of mold filling gates and minimizing knit and weld lines where flow fronts meet. It’s important to note that both stiffness and strength are not just material properties, achievable levels of stiffness and strength are highly dependent on component design. With plastics, simply doubling a wall thickness doesn’t directly correlate to attaining twice the stiffness or strength. Commonly with plastics, coring out thick wall sections and including ribs and gussets increases stiffness and strength. These design techniques provide more load carrying ability, as components with thinner and uniform wall thickness contribute to fiber alignment and are easier to produce using injection molding processing. In the first graph as the beginning of this article, significant increases in toughness or durability occur to the far right, well within the range of long fiber composites. Short fiber compounds have good capability for providing stiffness and strength improvement, but generally as ductile polymers become more rigid they also become more brittle. Fibers in polymer matrices function as force dissipaters. Strength improvement comes from the weaker polymer transferring load stress to the stronger reinforcing fibers. In the case of durability, as measured through impact resistance, short fiber keeps stress more localized to a particular area whereas longer fiber lengths have higher aspect ratios giving them more ability to dissipate impact stress throughout a plastic component. 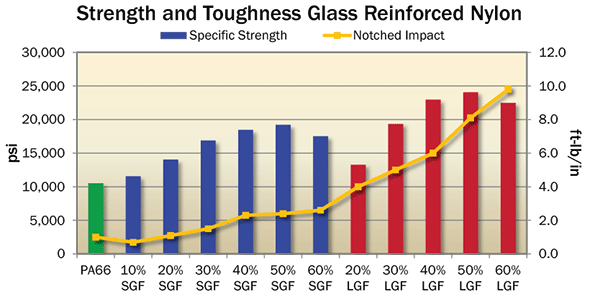 In the glass and carbon fiber strength and toughness comparison graphs, the yellow lines indicate notched impact resistance. They show an incremental and stepped rise in composite durability as fiber content and length increases. Toughness up to 4X unmodified nylon is possible with carbon fiber reinforcement and an outstanding 10X with glass fiber reinforcement. Although fiber alignment with flow occurs during molding, with longer fibers, particularly with more flexible glass fiber, there is some intertwinement to form an internal fiber skeleton within molded components. Because of this skeleton formation, long fiber composites are better able to resist crack propagation. Long fiber composites also excel at retaining their performance at elevated and low temperatures more than other reinforcement methods. It’s common for long fiber materials to have similar impact resistance at -60°F (-51°C) as they do at room temperature. Long fiber composites are unique among the available methods of reinforcing polymers because they are the only one capable of providing a performance trifecta by boosting stiffness, strength, and toughness simultaneously.